More than a dozen students are working on a variety of research and digital scholarship projects with the Libraries this summer. Each summer, the Libraries sponsor several student research internships and provide a home base and staff support for faculty research assistants. 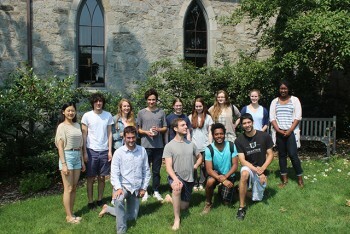 This summer, over a dozen students are working on research and digital scholarship projects in the Libraries. In their own words, here's a snapshot of who they are and what they're doing. The Cope-Evans Project, which began last summer, aims to make the digitized materials from the Cope-Evans family papersâ€”comprising more than 3,000 letters, business papers, and other materials from the two prominent Philadelphia Quaker familiesâ€”more accessible to scholars, and to present the data from them in new and useful ways. This summer, we read more than 425 letters written by three women in the families between 1870 and 1910, focusing on how they write about health. We will be adding a section to the Cope-Evans Project website that presents our findings and data visualizations. This summer, I am researching the history of astronomy for an exhibition I'm curating for fall 2016. I am working with librarians from Quaker and Special Collections and digital scholarship as well as history professor Darin Hayton, all of whom have helped me think about what it means to design a public exhibition. My research has focused on the telescope's role in the development of astronomyâ€”from a practical field used primarily for navigation in the 17th century to an academic discipline taught in American colleges and universities (including Haverford) in the 19th century. I am now developing the themes that will provide the intellectual framework for the exhibition. Victor's internship is made possible by the Joseph E. O'Donnell Library Research Internship Fund. Along with Lindsay, I'm spending the summer researching the early history of the Friends Asylum for the Relief of Persons Deprived of the Use of their Reason (now Friends Hospital, in Northeast Philadelphia). Founded in 1817, this was the one of the first mental health institutions in the United States that employed moral treatment for its patients. We are looking at how the founders' Quakerism influenced their ideas about mental illness. The research that Lindsay and I have been doing will go on the website that Lindsay is making and provide a framework for future projects about Quakers and mental health. Working in conjunction with Abby and the research she is doing, I am creating a website that focuses on the early years of the Friends Asylum. Haverford's Quaker & Special Collections houses a large volume of materials from this period of the Asylum's history: letters, diaries, superintendents' logs, patient records, and more. Abby and I are using these materials to frame the early history of how the founders' Quakerism informed their approaches to treating mental illness. For the website, I am looking at ways we can extract data from the collection which can then be presented in interesting and interactive visualizations. I also hope to create the website in such a way as to lay the groundwork for future digital projects related to Quakers and mental health. Abby and Lindsay's internships are made possible by a generous grant from the Scattergood Foundation. Owning a small business can be a tough but very rewarding endeavor, however not everyone has all the resources they need to be successful. Mapping Microfinance, a project started by economics professor Shannon Mudd in collaboration with Coordinator for Digital Scholarship and Services Laurie Allen and Digital Scholarship Librarian Mike Zarafonetis, attempts to facilitate learning and access to resources that catalyze the creation of small businesses, such as small loans and training workshops. This summer, we are collecting information about microfinance organizations in the Philadelphia area and creating an interactive map of them, as well as redesigning the project website. We hope that by this map, small businesses in and around Philadelphia will be able to thrive and the communities which foster them can grow and develop. I am working as a digital scholarship intern this summer, helping with the technical side of several student projects. For the first few weeks, I helped with data input for Monument Lab: Creative Speculations for Philadelphia, a public art and urban research project that took place at Philadelphia City Hall for three weeks in May and June. The project, led by Haverford Postdoc Writing Fellow Paul Farber, invited people to speculate about what an appropriate monument for the current city of Philadelphia would look like. The work I did enabled us to create a digital map of the monument proposals that's now on the project website. After that, I turned my attention to fixing up two transcription sites, Ticha and Beyond Penn's Treaty: Quaker and American Indian Relationships. As the summer continues, I am looking forward to learning PHP and CSS and honing my troubleshooting skills. I spent the first part of the summer on Monument Lab, working on the the ground at City Hall to talk to people about the project and help them submit their monument ideas. Once that project ended in June, I started working with the digital scholarship librarians on building a website for Professor Jim Krippner's History of Haverford College writing seminar this fall. This Omeka site will allow students in the seminar to add annotations to documents, photographs, and other objects from the College's history. I am working on an exhibition that will go up in Magill Library this fall which presents the work of students from the writing seminar,“Peace Testimonies in Literature and Art.” In it, we will look at Quaker volunteer efforts in the Spanish Civil War and connect them to the work of contemporary artists and writers such as Virginia Woolf and Pablo Picasso, who expressed their pacifism through their art. My main task is to work on the layout of the exhibition website, which was created using Omeka, an open source web-publishing platform. I am adding new materials to the website, specifically digitized materials from Quaker & Special Collections that will be part of the physical exhibition. I'm working with classics professor Bret Mulligan on improving The Bridge, a digital Latin and Greek vocabulary learning aid he started last year. This encompasses work on the website's front endâ€”improving user experience and adding new functionalityâ€”and back endâ€”restructuring the database to better support cool new features in the future. I'm coming to this project without any experience in web development, but the Libraries' digital scholarship team makes sure I can do substantive work while I pick up new skills. It's been a fun, productive, and edifying summer so far! I'm working with the digital scholarship team and librarians from the Tri-Co to redesign the Tri-Co LibGuides homepage. The new interface will make the content easier to navigate and search. As someone who has done digital scholarship projects in previous summers, I'm also providing support and mentorship to other DS interns. We will be posting video interviews with our student interns to the Libraries website later this summer, so stay tuned for more!